We’ve got two big things to talk about this week! One is something you may have heard about already if you’ve been following these Dev Updates: the User Interface! We’re wrapping up a new layout design for Alpha 2 and so it makes sense that we talk about some of the decisions that went into making it. The other would be… well, you! Last week we asked for your input on mining systems! Now we get to review how our participants voted! But first, how about we talk about the user interface since that’s something you’ll see happen in-game a lot sooner. If you played in Alpha 1.0 or 1.5 or have popped into some of our Twitch streams, you’ve seen our current UI. We started with a single pane of UI to house most of the menu functionality and that was able to work (to put it generously) because there wasn’t much to do. As systems evolved, however, we quickly came upon the very limits of our UI functionality and it became obvious that we needed push things forward. We evolved toward a tabbed menu system that works much better from a functional perspective, but has been in serious need of some cosmetic updates. Our upcoming, cleaner layout is a breath of fresh air and a huge step in the right direction. We have more visual indicators, better hierarchy, dividers, tooltips, and a lot more subtle design cues to not only aid in the design, but also increase the usability and feedback provided to the player. I know our UI will continue to evolve along with the game, but we’re really excited to see this new design work its way into our internal builds in the weeks to come! Be sure to keep an eye on our Twitch channel to see the new UI in action when it is available! Now! Onto your feedback! Last week, we asked for your thoughts on our internal discussion about an active mining mechanic versus a more passive one. We put up a poll for the question on Twitter and the results were very enlightening. None of us are surprised that you all prefer active game mechanics to passive ones, but I’m not sure if any of us were expecting such a distinct advantage in favor of active mining. 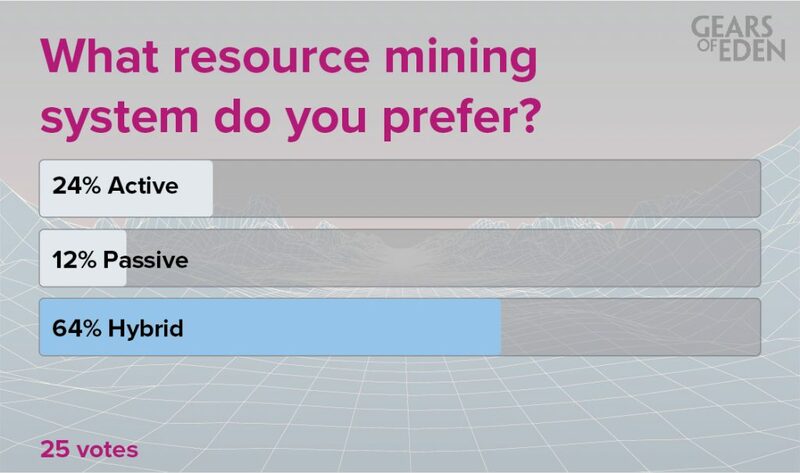 There is exactly twice the number of people in favor of active mining as there are in favor of passive mining! What’s important to note though is that both of these options are blown out of the water by the number of people wanting a hybrid approach, in which you can swap from active to passive at will. This makes a lot of sense. Usually when I’m playing a game, I’m actively playing the game. But every so often, I’ll be watching TV or get a text and it’ll take my focus for a minute or two. In that time, if I’ve already proven that I know how to accomplish the standard gameplay loop of mining, it might be nice to have the game be a pal and get me some iron. This is important for us to think about as we move forward, and you can bet we’ll be delving further into this discussion after the launch of Alpha 2. Until then though, we’ve got a lot of work to do and we want to keep you informed with more Dev Updates like this one! So follow us on Twitter and Facebook to get the latest and great Gears of Eden news! That’s all for now, but I hope you have a great rest of your week. Thank you so much for reading!